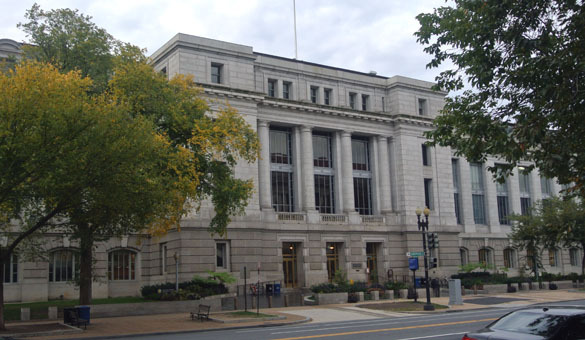 WASHINGTON, D.C. — It is Fall Break at the College of Wooster, so some of the geologists have taken the opportunity to get out of town. Dr. Meagen Pollock is under the bright blue skies of the gorgeous state of Arizona. I am now under a string of fluorescent lights between two rows of cabinets deep in the Smithsonian National Museum of Natural History (above) in overcast and gray Washington, D.C. We are both having fun in some very different ways! I am here on a project studying some enigmatic encrusting fossils from the Paleozoic. Paul Taylor and I want to sort out the mysterious systematic identities of Allonema, Ascodictyon and related forms commonly inhabiting hard substrates, especially in the Devonian. All we can say for certain now is that they are not bryozoans! 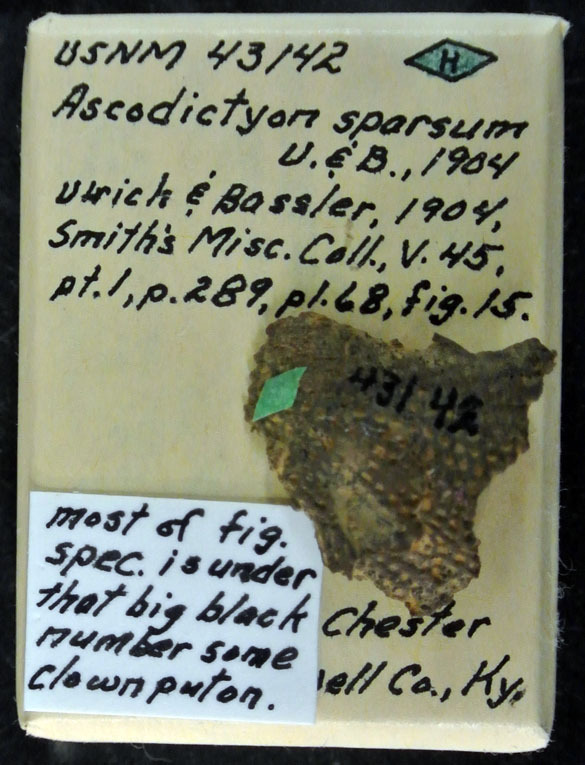 The specimen above, for example, is USNM 43129 Allonema fusiforme (Nicholson & Etheridge, 1877) figured as Ascodictyon fusiforme in the Treatise of Invertebrate Paleontology, pt. G, p. G35, Fig. 9-3. 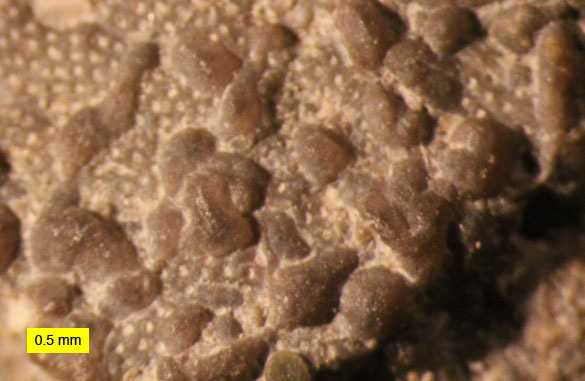 It was collected from the Devonian of Michigan. It doesn’t look like much more than bubbles of calcite under a light microscope, but later Paul Taylor will show its glories through scanning electron microscopy. I am the advance member of the team, looking through specimens to find the best for Paul to borrow when he visits later this month. We’ll have much more to say about these fossils later. 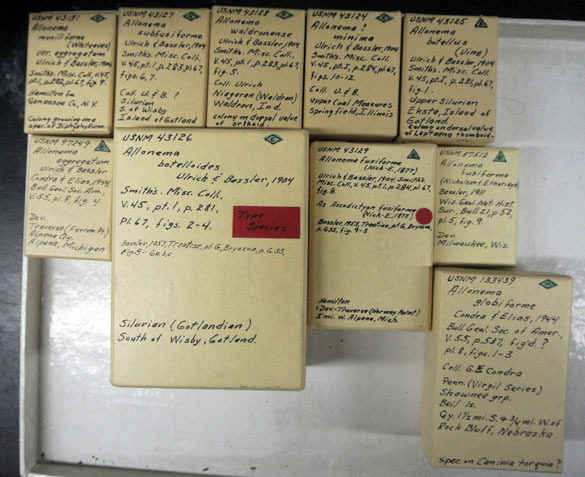 Above are the specimen boxes for species of the genus Allonema. Note how much information is packed into the small space on the top of each box. Paul and I go through these boxes and examine the specimens they contain with light microscopes in the museum galleries. There is some humor in the dry world of systematic paleontology. This is my work station while at the museum. 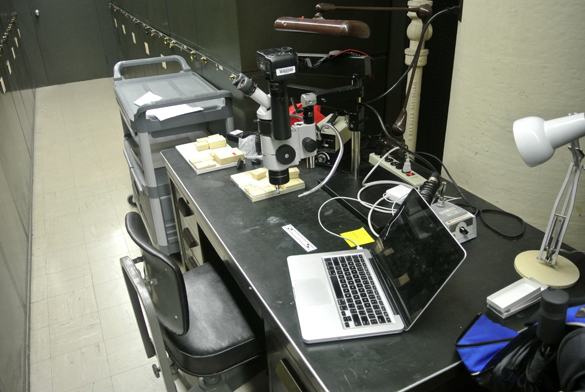 Note the nice photographic tube on the microscope, the comfortable chair, and the lack of any distractions! I’ve saved the best part for last. Why the plural “Wooster Geologists” in the title? Because the Collections Manager of this world-class paleontological museum is one of my former students — Kathy Hollis (’03). 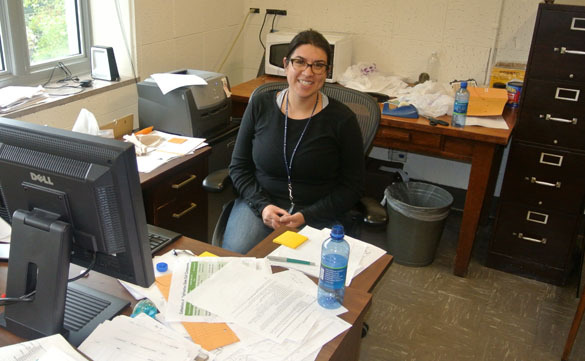 Here is happy, efficient, uber-competent Kathy in her office, clearly in her element. We are very proud of her at Wooster. It is so cool to see her at work in one of the most paleontologically exciting places you could be. Makes up for the gray skies! Hahahaha! You paleontologists…so funny! We’ll have to compare our tans when we return to campus.